Yes, again. Like you’ve never been obsessed with a plate shaped like an autumn leaf before. I was recently reading Wayfaring Chocolate, one of my favourite food blogs, and its writer/custodian Hannah acknowledged her considerable fear of spiders, and how she hilariously freaked out at the sight of one in her room before realising it was in fact a sock that she’d owned for years, with spiders printed on it. In this spirit of laughing with, not at, I’d like to disclose how massively scared I am of…pelicans. Now as I said last time, I’m honestly pretty scared of many things, to the point of it not being particularly hilarious (I’m talking panic attacks) but people tend to find this specific fear funny. And well they might. When Tim and I were in Europe earlier this year we went to three different zoos and every time, I had to get Tim to be on lookout for them and whenever they were on the horizon, he’d tell me which direction to not look in order to avoid accidentally seeing their scary eyes and death-beaks. In case you’re wondering what’s the deal, well solidarity, for one thing. And it’s a blog! I share without hurdles, I share without filters! (Don’t worry, this is actually me filtering.) And in case you’re wondering what’s the deal with pelicans, I had a spine-freezingly scary nightmare about them. And from that night forth, I’ve tried to keep my distance and avoid eye contact with them. Anyway: Noodles. I love them. Cold, hot, spicy, salty, satay-y, wide, thin, whatever. In this case, intertwined with vegetables and with a hot and sour sauce coating each cold strand of soba. The always-important Nigella Lawson has this cool salad in Nigella Express which uses tom yam paste in the dressing, which uses the flavours of soup that you’d normally use said paste in, but in a concentrated manner. I took that dressing and instead dressed grainy buckwheat soba noodles and steamed vegetables with it. It only turned out the way it has because of what I had in the fridge and freezer (not a lot, to be honest) – you could use any number of things to make it SO much better than mine. Like broccoli, avocado, carrots, rocket, zucchini, mushrooms and so on. You could also swap it for any other noodles you’ve got hanging round – rice sticks, ramen, somen…I wouldn’t choose udon for this, since it suits a more solid bitey strand, but really as long as you’ve got the dressing, you’re all good. I know I said it’d be Banana Pudding Ice Cream this time, but I only ended up making it late last night, and it wasn’t properly frozen this morning. So no photos, and therefore no blog post. I can tell you though, having ploughed into it with a spoon several times, that it is amazingly good and will be worth the wait. Serves as many as you provide for. I’d hazard a guess that this dressing can deliver for noodles for between 1-4 people, any more than that and start increasing quantities. Selection of vegetables – I used frozen peas, frozen soybeans, cavolo nero, and one smoked capsicum because that’s all I could cobble together. Coriander or mint, sesame seeds, sesame oil etc to serve. Cook the noodles according to packet instructions. While you’re boiling the water for the noodles, fit either a metal colander or a steamer over the top of the pot you’re cooking them in and put in it any of your vegetables that need cooking (like…peas yes, avocado, no) and allow them to steam away. 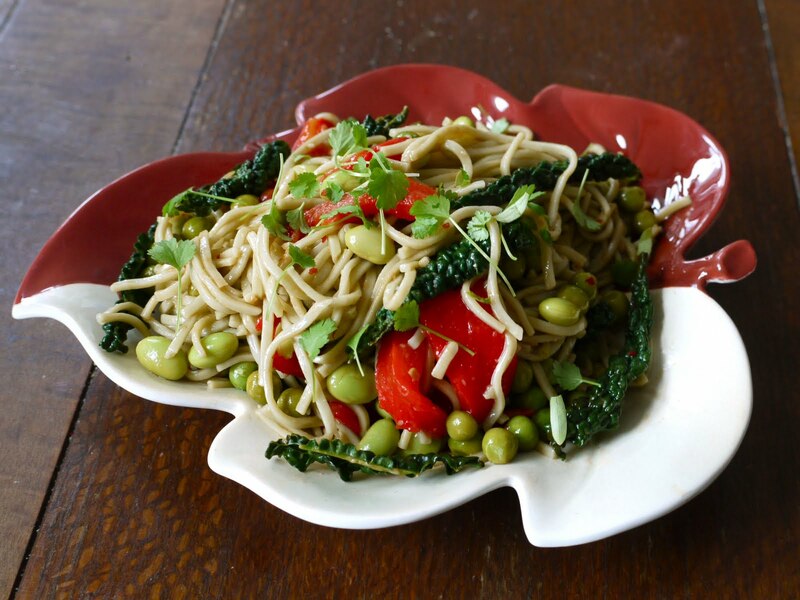 Tip the noodles into the bowl as well and carefully mix it all together to incorporate the vegetables and the dressing. Divide between the plates of people you’re serving. Top with coriander and/or mint, and sesame seeds if you like. Super spicy and sharp and awesome. Taste to see if you need any more of a particular ingredient – don’t feel constrained to the (admittedly already vague) parameters I gave you. You might find you want more heat, more salt, or that you want it to be oilier. 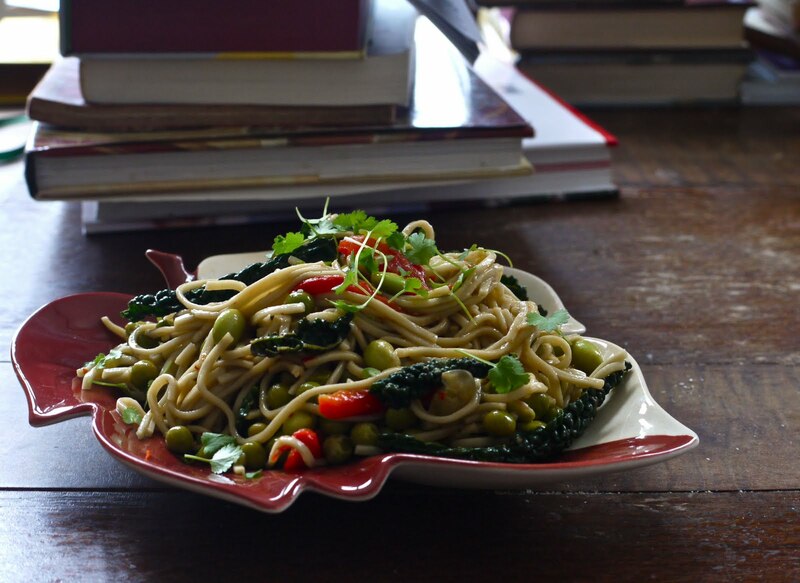 Tim and I had this for dinner on Monday night and it was damn wonderful, the slightly softened greens leaning into the noodles as they twirled round my fork, and the strong buckwheat flavour of said noodles being ably challenged by the hot, limey dressing soaking into them. We then had it for lunch today, and apart from the already annoying peas (they just don’t stick to your fork) losing their bright colour overnight, it was just as good on day two. Somehow, even with the internet making everything accessible and instant, I hadn’t thought to look up Missing You from the Set It Off soundtrack, which would make it…15 years since I’ve heard it? It’s emotional, it’s harmony-tastic, it’s got CHAKA KHAN. Closely rivaled by En Vogue’s equally dramatic Don’t Let Go (Love) from the same album, for ‘best song ever from a movie or anything ever’. Next time: That Ice Cream. 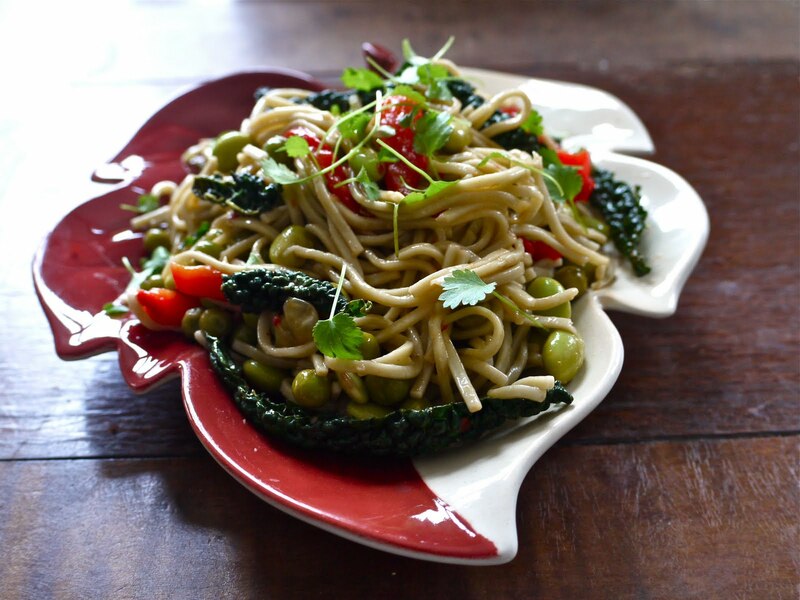 Seriously good looking noodle salad. Seriously awesome plate. 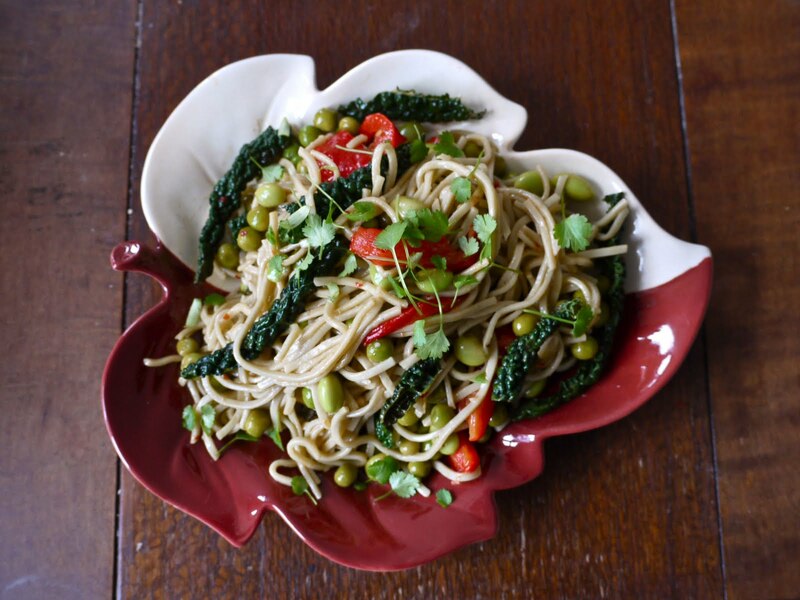 I don't use buckwheat noodles enough — they are so versatile, warming (even when cold) and such a cool colour. Now the pelican thing… Pelicans are my good luck bird. I was first entranced by them dive bombing for fish somewhere in Chile, and then they flew across my path a few times as I drove into San Francisco, promising a special visit. But I'm afraid of horses, wetas, spiders, and corned beef… so to each their own phobia! Also, while I've never been scared of pelicans (probably because I don't have any pelican socks), I do find it really unpleasant to think of the stored fish rotting away in their gullets. Sounds delicious…haven't come across tom yam paste…must keep an eye out as I love tom yam soup. And me I am scared of spiders….not good with them at all 🙂 And never a fan of feeding the ducks as a child or an adult either as they all come quacking right at you! Very much looking forward to the banana pudding ice cream! If I had a gullet, I could eat so much more! Maybe. Hold on. Oh. I just googled what gullet is, and it looks like I already have one. I guess I more accurately need to learn how to store food more (im)properly in it. I have always thought of pelicans as being ridiculously cute. I have never thought of Elton John as being anywhere near cute. Spiders are mildly cute to me, En Vogue is on the fence, and I love soba noodles. Love the cavolo nero in this. I've never used it in Asian-y things but it makes perfect sense. Oh pelicans! Never thought of them as scary but I guess they are pretty sinister, seeing as they can eat small dogs and everything… yikes! Your blog is absolute perfection.